Ready to go for the greenest motorized tour in Atlanta. Atlanta is a fascinating city with an interesting history, but it can be hilly and is hot in summer. This can present problems for Levelers, but I've found a solution. Just remember, touring a city you think you know can be an humbling eye-opener. 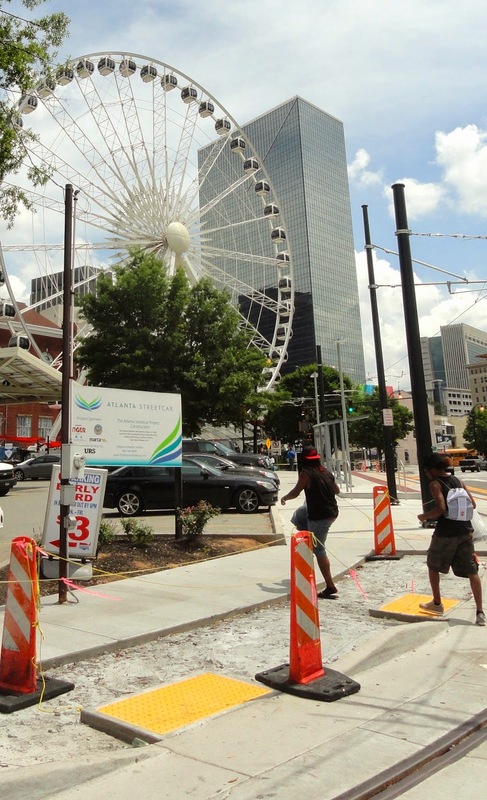 I've been visiting Atlanta since I was seven years old, but on a city tour with ATL-Cruzers, I saw new sides of the city. • Thrasher, Marthasville and Lumpkinsville were among Atlanta's several previous names. • Sweet Auburn Avenue was where the affluent African American community gathered including John Wesley Dodd, who began as a postal clerk, rose to wealth and was the late Mayor Maynard Jackson's grandfather and Martin Luther King Jr.'s mentor. Aretha Franklin debuted here the Top Hat, now known as the Royal Peacock. The Sweet Auburn Bread Company makes the best sweet potato cheesecake in town. King Center. Photo © by Judy Wells. • Ebeneezer Baptist Church, now a museum, and the King Center where MLK Jr. and his wife are buried are a national park. Both Martin Luther King Sr. and Jr. were originally named Michael. The Kings lived here. Photo © by Judy Wells. After reading about Martin Luther, King changed his and his 5-year-old son's name to Martin. The yellow and brown house is where MLK Jr. was born. Don't resist the Cremolattas. Photo © by Judy Wells. Now anyone can stay in Inman. Photo © by Judy Wells. • The Inman area was the original millionaire's row. Designed to keep the ordinary citizen as well as the riffraff out, lots alone cost $3,000 in 1890! One of the original houses Sugar Magnolia, is now a bed and breakfast. Coca-Cola founder Asa Candler lived here. The last week of April, the Inman Park Festival attracts all of those ordinary people to tour a dozen or so of the houses, for a fee. • Cabbage Town and the Edgewood neighborhood are fast becoming an entertainment and foodie hot spot. • Oakland Cemetery, opened 1850, is a fascinating area to wander. Here you will find the final remains of Margaret Mitchell, Bobby Jones and Maynard Jackson. Every summer there is the Tunes from the Tombs music festival. Bring your appetite to Municipal Market. Photo © by Judy Wells. 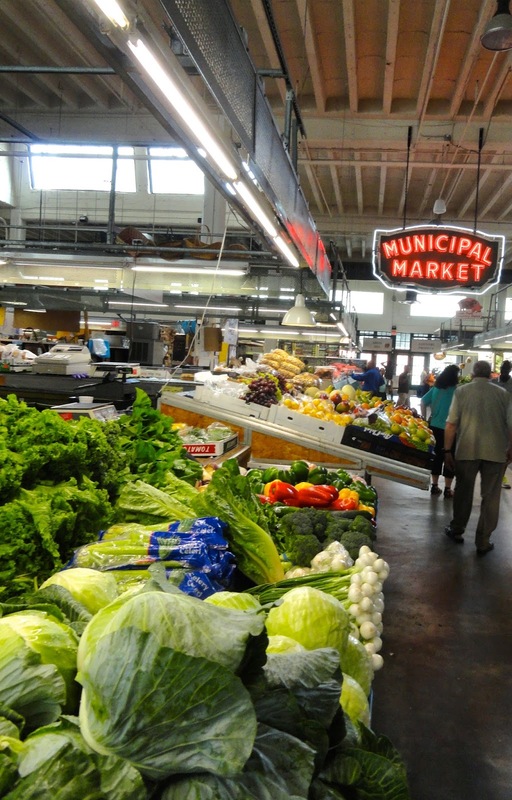 • The Municipal Market, known to locals as the Sweet Auburn Curb Market, is a great farmers' market where you can nosh on the cuisines of 11 different countries and try a piece of that sweet potato cheesecake. USA Today named it 16th of the world's top 20 farmers' markets. 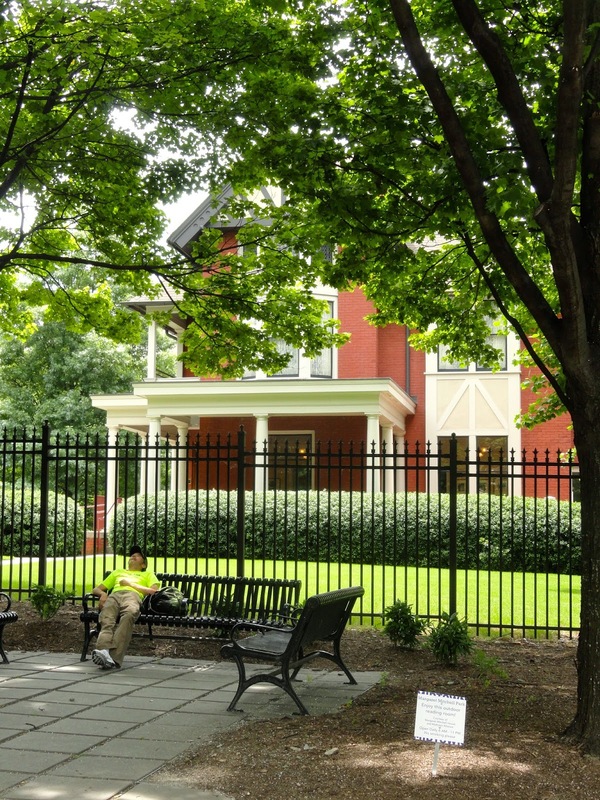 • SoNo, South of North Avenue, is where you'll find Emory University as well as Gladys Knight and Ron's Chicken and Waffles Restaurant. Margaret Mitchell lived here. Photo © by Judy Wells. • Midtown Village is where you'll find the Flying Biscuit, a 24-hour breakfast spot, the Interactive Rock and where Margaret Mitchell lived in a basement apartment she referred to as "the dump." Skyview Atlanta. Photo © by Judy Wells. • Next came Georgia Tech, the Varsity, the striking new Center for Civil and Human Rights, next to World of Coca Cola, the unexpected Skyview Atlanta ferris wheel ($15 for two rotations, $30 for four rotations in the clear-bottom VIP gondola) and we were back at home base, entertained and surprisingly wiser. Diving horses are gone but the streets made popular by Monopoly game boards are still there. Photo © by Judy Wells. Atlantic City, which may have been America's first beachfront resort, has been supplanted by newer, glossier destinations but it still offers visitors an interesting stay. After all, this city of 487,000 welcomes and entertains 20 million of us a year. The good news for Levelers: It's flat. The bad news for Levelers: Casino hotels are like airports with flashy decor and electronic slot machines. In other words, you will have to walk a lot to get wherever you want to go unless you are content to stay in the casino. Apologies to casino owners' bottom lines, but that would be a shame. Nucky's hotel home. Photo © by Judy Wells. First there's the iconic resort as portrayed in the HBO series "Boardwalk Empire." As city fathers will tell you, the show would be a lot better if it had been filmed in Atlantic City, but they also point out the hotel Nucky Thompson called home. Hard to miss the Steel Pier. Photo © by Judy Wells. The Steel Pier hasn't been steel for a long time (it's concrete) and no horses dive into tiny tanks, but you'll find midway-type games and rides, including helicopter spins over the area. Games are popular but pricey - $5 a go. Photo © by Judy Wells. The view of the Boardwalk from the end of the pier is pretty impressive. Atlantic City shoreline at night as seen from the end of the Steel Pier. Photo © by Judy Wells. Strolling the boardwalk is a must. Photo © by Judy Wells. The Boardwalk itself is wide and infinitely stroll-able. The rolling chairs to save you steps are still there as are salt water taffy shops and assorted kitsch. Speaking of the taffy, it comes in more flavors than Ben & Jerry's and the two original competitors, James' and Fralinger's, are now made under the same roof. A new museum on the boardwalk.Photo © by Judy Wells. New this summer is the Historical Museum at Garden Pier, a small but fascinating collection of Atlantic City artifacts from an original wicker rolling chair and Mr. Peanut costume to the champagne bottle with which Frank Sinatra christened Resort's International. 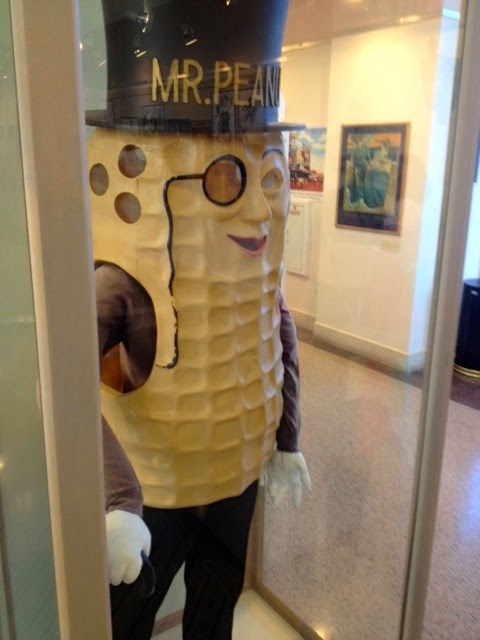 Mr. Peanut was a popular regular on the old Boardwalk. Photo © by Judy Wells. Ducktown and Southern Italian cuisine are synonymous. Photo © by Judy Wells. Head to Ducktown for southern Italian fare. The once marshy area where ducks congregated is where Italian immigrants settled, bringing with them those rich, dense tomato sauces. That's also where you will find popular bakeries and the results of efforts by the city and Richard Stockton College to revitalize downtown. The Stockton Noyes Arts Garage is home to dozens of artisans and their work. The Dante Hall Theater, once the gymnasium and hall for St. Michael's Catholic Church, has been renovated and turned into a performing arts center. 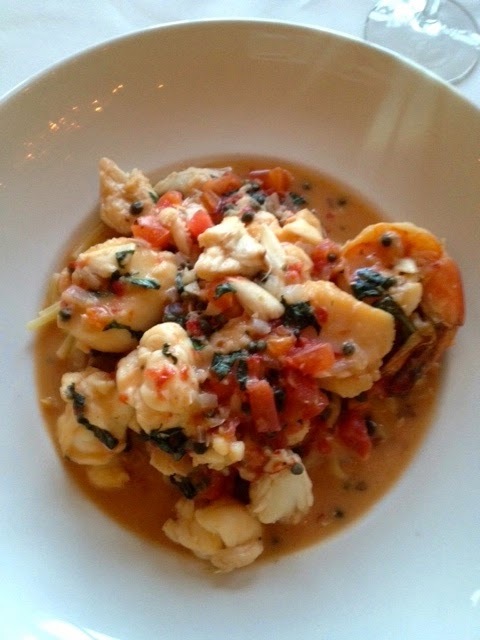 Seafood Zuppetta at Capriccio. Photo © by Judy Wells. Tip: For Northern Italian, head for the exquisite Capriccio at Resorts. Other arts installations have been introduced to revitalize the downtown but are dwarfed by casinos. Absecon Lighthouse. Photo © by Judy Wells. The 1870 Absecon Lighthouse is hard to miss. It is New Jersey's tallest, the third highest in the U. S. That means 228 steps to the top. Tip: I recommend Levelers just look at it. Gardner's Landing and the back bay. Absecon (Ab-SEE-kin) is the original name of the island now known as Atlantic City and you will find a far less flashy world as you head away from the ocean. Blocks of pristine, pastel-toned Victorian Modern homes - attached, single, condos - are a successful example of city revitalization and gentrification. Boats, breakfast and the view are highlights of Gardener's Landing. Photo © by Judy Wells. Gardner's Landing is another stab at it in one of the more historic areas. 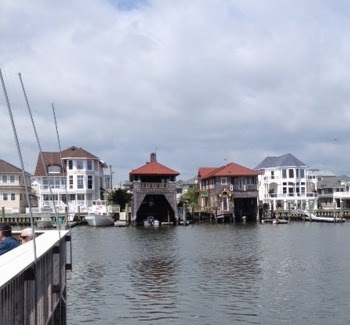 The excursion and fishing fleets anchor here accompanied by a small aquarium, gift shops, a pub and another Atlantic City institution, Gilchrist Restaurant, where locals flock for breakfast and lunch. Yum. Photo © by Judy Wells. 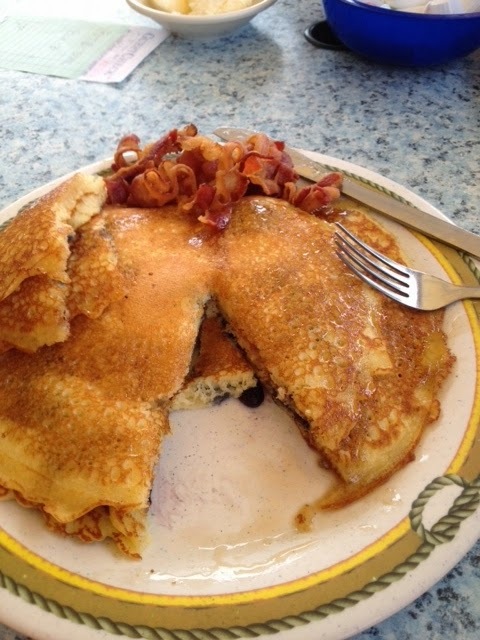 Tip: Ask for a table outside to enjoy the view and order the blueberry pancakes. Locals also recommend the spicy Italian sausage. Bootleggers' paradise. Photo © by Judy Wells. While you are sitting there, note the two older, brown shingled houses across the basin. This was once a hotbed for bootleggers as you know if you've watched "Boardwalk Empire," and these houses are the remnants of that. Speed boats could outrun revenuers, tuck into the covered slips and the booze would be off premises and on its way in minutes. Dale Chihuly greets you with a splash at Borgata Water Club. Photo © by Judy Wells. Across the basin you can't miss the highrise casino hotels. The most tasteful is Borgata's Water Club with Chihuly chandeliers, a dream of a spa and a knockout view. It's a resort first, casino second and one place where you don't have to walk yourself to death. The better casinos have door-to-door limo services from the Philadelphia International Airport. In town, the jitney service goes just about everywhere for $2.25.